Not a problem my squad can’t fix. Martin Pedersen was 17 when he programmed and co-designed Battle Squadron for Amiga in 1989, and it shows. Not because the game is immature or broken – far from it. Rather, its exuberance makes other shoot-em-ups feel sluggish by comparison; a game made by a brilliant teenager for other brilliant teenagers with energy and brains to spare. This is great if you too are a 17-year-old wunderkind. For those of us sailing through our 30s and 40s, Battle Squadron is an exhausting, unrelenting adventure. Too much fighting, not enough bathroom breaks. Before you dip your ship into the alien world of Terrania, head to the settings. Turn up the lives and the credits as high as they go, then consider the unorthodox choices, “Max. Enemy Bullets” and “Enemy Bullet Speed.” The game lets you choose between 8, 12, and 16 bullets on-screen at any one time, and the bullet speed ranges between 75-400. Since you’re already planning to die a lot, lower the on-screen bullets to 8 and set the speed to 150. Any speed higher than that is crazy and any lower means the bullets just crawl across the screen. 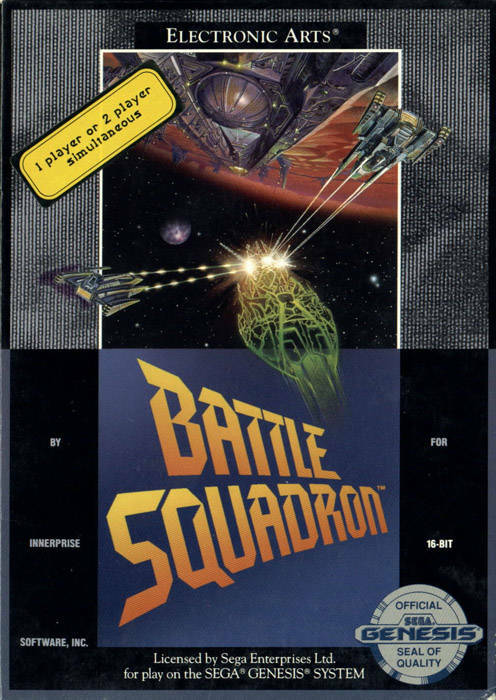 Unlike some shoot-em-ups that whisk you from planet to planet, Battle Squadron keeps you on the planet Terrania. You begin on the dijon yellow surface where the action is intense, but not unmanageable. Turrets, bombers, and tanks are about all you’ll face here. Once an enormous dark chasm appears, prepare to move underground and into the thick of war. Here, large bug-like creatures known as Biotech Wingmen attack in packs of 6 or more, alongside fighters and gunships. Large enemy bases unleash all manner of hell at you, with tiny turrets, Wingmen, and bombers backing them up. Objects in the foreground sometimes overshadow your field of vision (a la Phantasy Star II), so you literally can’t see oncoming enemies or projectiles. Should you survive, you’re thrust back onto the surface with barely a pause. Two more subterranean excursions and a final boss battle later, and victory is yours – if you make it that far. To cut through the clutter, Battle Squadron provides four different weapons, all of which can be upgraded up to five times. The Red Magnetic Torps are a stream of energy balls that fire in the front only and need at least three upgrades to be useful. The Blue Anti-Matter Particle Beam is the only weapon to shoot backwards and forwards, but its narrow range can be a problem. The Orange Magma Wave is a 5-way attack that’s powerful in the front, but lackluster on the sides. Like the Particle Beam, the Green Emerald Laser has a narrow range, but it’s so powerful that it’s my favorite weapon anyway. You’re also given 3 Nova Smart Bombs at the beginning of each life. While they don’t clear the entire screen when used, they do dispose of all enemies and projectiles within a certain radius. Blast Squadron is an exhausting ride through an unforgiving alien landscape. It’s too hard, it’s unfair at times, and it doesn’t stray beyond the traditional space shoot-em-up formula. Even with these demerits, the game is the most engaging shmup I’ve played in a long time. There are moments when the game’s manic zeal overwhelms you, and you think, “Is all this really happening?” Chalk it up to Martin Pedersen and the cheekiness that comes with youth if you want, but the game’s clear delight in its desire to destroy the player is endearing, in a snot-nosed sort of way. Take it from someone who’s already played way too many shoot-em-ups on my Sega journey: Blast Squadron is a cut above, even when it’s behaving like an obnoxious brat. Well, someone needs a cold shower. It is another reason I love Sega’s 16-bit machine you’ve got games coming from all 3 big gaming regions and a nice contrast in styles. You’ve got Japanese games, American games and European games all feeling a little different. Variety is good. All that colour really marks out the game’s Amiga origins. Some great pixel art there. Seriously? I don’t recall enjoying this game at all when I got it from KayBee Toys, and I’m a huge shmup fan. Of course, there was no Internet back then so I had no idea on what to set the bullet speed and max number of bullets to have a good experience so I kept fiddling with those options and never quite getting them right at all so that’s probably why I gave up on it.